Once you log in to Dashboard Account you are redirected to the Payments tab. 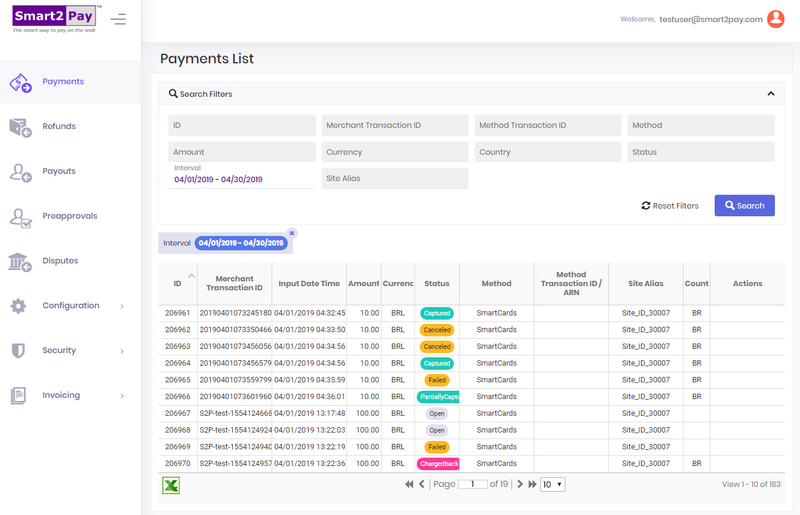 Here you can see the complete list of all the transactions made with the payment methods assigned to your merchant account. 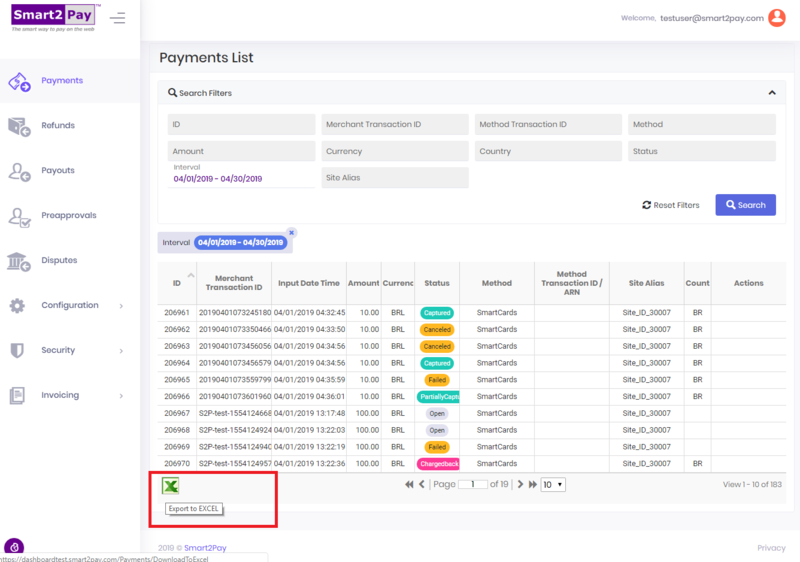 You have the possibility to search for specific payments using different search filters, to see the details of the payment invoice and fee, and to export your payments into an Excel file. When you access the Payments tab, the Search Filters section is expanded. In order to collapse it just click the arrow on the right of the screen. You can search payments by: ID (the payment id in the GlobalPay system), Merchant Transaction ID (the payment id in your system), Method Transaction ID (used for transaction tracking and matching with customer receipt or bank statement), Method, Amount, Currency, Country, Status, Interval (from – to) and Site Alias. Please note that for SmartCards transactions there are specific additional search filters that will appear, like: Authorization Code, Acquirer Ref Number, Masked Card Number and Card Holder Name! 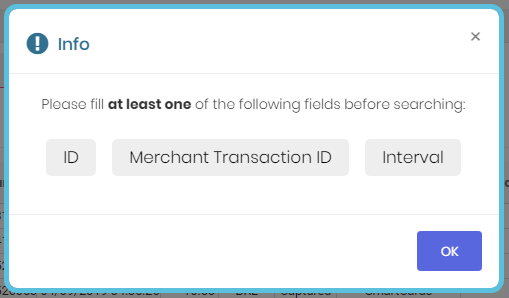 In order to find a specific transaction, you need to fill at least one of the following search filters: ID, Merchant Transaction ID and/or Interval. After you have found the transaction you’ve been looking for, using the proper search filters, just click on it to see the specific details of that payment. A new window will open containing the general details for that Payment ID and also providing details about specific sections, like: Credit Card, 3D Secure, Fraud Check, Reporting, Flags, Reason Codes, Dispute and Invoicing. The list of payments can be exported (filtered or not) to an .xls file. Click on the Export to EXCEL button at the end of the list of payments. The downloaded file contains the following information: ID, Merchant Transaction ID, Originator Transaction ID, Input Date/Time, Amount, Currency, Status, Method Name, Status ID, Method ID, Method Transaction ID, Payment status date/time, SiteID, Site Alias, Country, ReasonCode and Reason. The column Payment status date/time represents the time when the last final status was updated for that transaction.